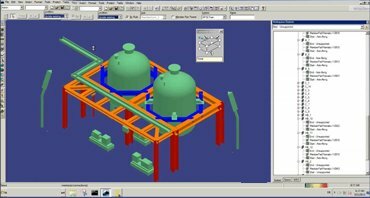 SP3D course will cover the fundamental principles and concepts used in smart plant 3D (SP3D), Equipment and furnishing, Piping, Drawing and reports. +–What is the objective of SP3D training ? The objective of SP3D course is to provide the delegates the in-depth knowledge and skills in this discipline to facilitate faster learning curves while on the job. SP3D course will cover the fundamental principles and concepts used in smart plant 3D (SP3D). Upon completion of SP3D training the delegates will have a clear understanding of the design and engineering principles used in smart plant 3D (SP3D). +–What is the duration of SP3D training? ▸▾Who will benefit from this course? Aspirants wish to become either planner in project planning field or shutdown planner/scheduler with or without knowledge about industries like petrochemical industry, refineries, thermal plants, oil and gas, power, nuclear-plants etc. ▸▾Pay-scale of SP3D Designer ? Vadodara, formerly called Baroda, is a city in Gujurat, a state in western India. The city have huge number of engineering colleges and they give nearly 90 to 95% of results, every diploma and non-IT engineers are qualified as become as sp3d engineer. Most popular core companies like petrofac, larsen & toubro are have their operating centers in gujarat. There is a bunch of opportunities for sp3d designer to both fresher & experienced professionals. Enroll now & build-up your career with us.